Hey there! 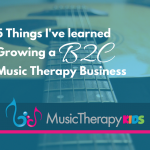 I’ve been spending a lot of time lately reflecting on my development as a music therapist. How I’ve grown. What I’ve learned. What mistakes I made when I first started out. What mistakes I still make. Even though I have a gained a substantial amount of experience, I am always learning and developing new skills. 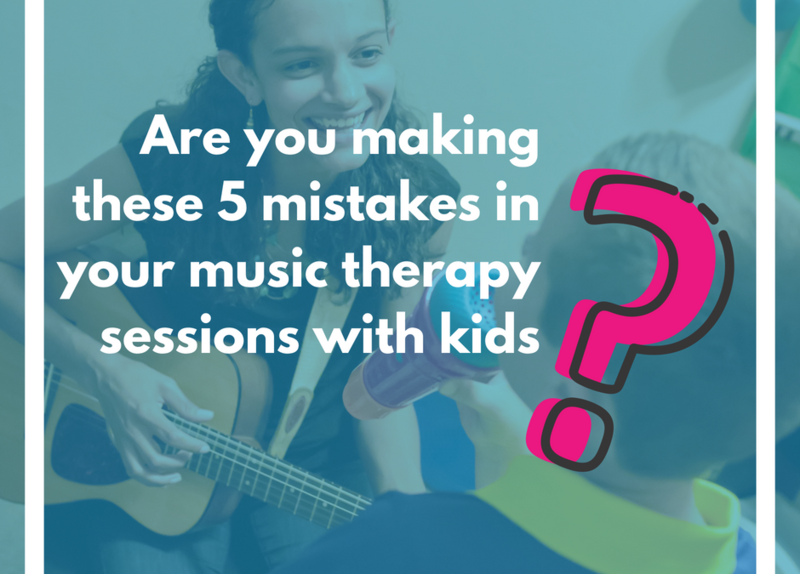 Below, I’ve identified 5 mistakes that I know I made, especially when I first began my career as a music therapist. Wondering if you too are making these mistakes? Read on. Mistake #1: Not Reading the room. Have you ever walked into a room only to realize that something’s just not right? There might not be a tangible event you can put your finger on. The roof isn’t on fire. The building is intact. But something just feels wrong? Tension in the air is a very real thing! Maybe the group you are about to see has had a very rough morning. Maybe everyone’s grumpy because it was raining on the way in. Or something has happened personally between staff members and you aren’t privy to the whole story. You don’t need to know but something is off. So what’s the vibe you are getting when you walk in (or the client walks in to see you?) Relaxed? Tense? Happy? Angry? Keeping your pulse on the overall mood is paramount to having a successful session. What if reading the room doesn’t come natural to you? In my opinion, that’s a blessing and a curse. Some days I would love not to sense all the different energy coming at me all day long. I could go about my business blissfully unaware. But of course this skill is very helpful in implementing great sessions! So, practice these three things. Stop. Listen. Ask. Stop. When you first greet your client or enter a space, stop for a moment to give awareness to your own energy level and then the energy level of those around you. Listen. Many times, the parents, teachers, or therapists of a child or group will have something to say. By listening you create that space for them. Ask. How are you? How has your morning been? Check in with the child and the adult. Depending on the situation, you might do a quick check-in musical activity. Mistake #2: Thinking you are there only to serve your client. This is perhaps one of the biggest mistakes I see happening across the board. And it’s easy to fall into this trap when you work in a school or facility where you have exclusive interaction with the child or client. At my center, however, the parents play as big a part (bigger really) in the services we provide. Failing to connect with the parents of the children we serve means failing to establish a long-term relationship. After all, the parents are the decision makers, not the children. 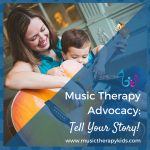 You can have the best music therapy session in the world and see all the progress in the world but without parental rapport and support, you have no clients. In the world of private pay and private practice serving parents too is key. Mistake #3 Sticking to your plan. You stayed up until midnight working on that session plan and by golly, it’s good! After investing a ton of time and energy into preparing for a session, it’s easy to want to stick to your plan come “h*ll or high water” (Tell me I’m not the only one who uses that phrase?). But what if it’s just not working? What if the child you arrived to see is bouncing off the walls and is really struggling with focus? What if your group is groggy and quiet? What if there is a fire drill in the middle of your session? (And that has happened to me by the way. Multiple times.) What if your client is having a meltdown? Throw that plan out! Don’t stick to your plan. Quite honestly, I think we music therapists are well suited to be flexible and adapt to our clients’ needs. That’s a quality that makes us unique. As musicians, we know that music is flexible and we can extend that flexibility to our clients. Mistake #4: Failing to provide structure. That’s because every client is different. An individual. At our center, our philosophy has always been to provide client-centered services. If a child needs an improvisational approach we provide that. If a child needs a behavioral approach, that is the route we take. Use a visual schedule. Mine is simple and sweet. Sing the same opening and closing song each week. This also simplifies your session planning and preparation time. 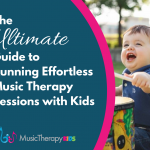 Incorporate the child’s preferred music into your session. An easy win to help you build rapport! Be Consistent. Is it ok for the child to move around the room? Do your group members need to remain seated on the floor? There is no right or wrong answer. Only the structure of your response being the same one every time. Use a token system. This isn’t for every client but it works wonders for some of mine! Some of the best advice I ever received was from my college professor. After observing one of my practicum sessions, he said four simple words that I will never forget. In fact, I have passed those words on to my practicum students and my interns. What are they? That sums up what I am trying to say. Stop explaining what you are doing and use the music to show it. Also, many of my kids on the spectrum are quite frank and literal. So if you say, “do you want play the drum?” and they say “no,” well…..you DID ask! If you say “read the music,” don’t be surprised when they start reading the words on the page rather than playing the instrument. Hi Mary! This is some great advice! I have a new contract that I will be starting soon. The school is an Autism school. I haven’t done a ton of work with school aged children and never worked with a group in which everyone has an autism diagnosis. The director’s one requirement is for me to use a picture schedule, which of course makes perfect sense. My question for you is…how would you suggest to utilize the picture schedule for structure, yet still allowing for some flexibility when there is a need to utilize that “trump card” or not to be overly rigid with your plan. Hi Lisa, I know it’s been a while since you asked this but I want to answer you – I have a picture schedule with a picture for each activity but usually I find it’s perfectly ok to swap out a card if I must. So on the back of my picture schedule are other options (i.e. trump activity, etc) and if I need to insert that into the schedule, I quickly grab it from the back and put it on the front!